Gordon Cooper, 77, one of the seven original U.S. astronauts, who made the nation's first manned spaceflights and became known as possessors of The Right Stuff, died yesterday at his home in Ventura, California. The cause of death could not be learned immediately. In the 1960s, with the nation determined to prevail in a space race with the Soviet Union, Mr. Cooper and fellow members of the Mercury program were all national heroes -- celebrities and larger-than-life figures who carried the nation's destiny into the void with them. Among Mr. Cooper's signal achievements was serving as pilot of the Faith 7 spacecraft in a 22-orbit mission in May 1963. That was the mission that concluded the operational phase of Project Mercury, the program that enabled the United States to put humans into space and lay the foundations for the moon landings. During his Mercury flight, Mr. Cooper converted a technical problem into a personal triumph. Equipment that was supposed to provide electricity for the reentry control system failed to function. Mr. Cooper found it necessary to fly his capsule to an ocean landing without the assistance of the usual variety of automated devices. He landed the capsule himself, 7,000 yards from an aircraft carrier in the Pacific Ocean. President John F. Kennedy, who had committed the nation to making a moon landing, called Mr. Cooper's achievement one of the great victories for the human spirit. Later, Mr. Cooper served as the command pilot of the Gemini 5 mission, which lasted for eight days, beginning Aug. 21, 1965. On that flight, he and fellow astronaut Charles Conrad set a record for time in space, when they covered 3,312,993 miles in 190 hours and 56 minutes. Mr. Cooper, the first man to make two orbital flights, accumulated a total of 225 hours and 15 minutes in space. He was one of the faces of America's fledgling space program, NASA administrator Sean O'Keefe said. He helped gain the backing and enthusiasm of the American public, so critical for the spirit of exploration, O'Keefe added. In addition to Mr. Cooper, who was an Air Force colonel, the original astronauts were Alan Shepard Jr., Virgil Gus Grissom, John Glenn, Scott Carpenter, Walter Wally Schirra Jr. and Donald Deke Slayton. They were celebrated as exemplars of The Right Stuff in the book of that name by Tom Wolfe and in the subsequent movie. The qualities they each appeared to demonstrate included an aviator's unflappability and an unshakable confidence in their skills and abilities that bordered on swagger. All were highly qualified pilots, and all endured severe physical and psychological tests and a demanding training regimen. Yet, within the group, whose members might have seemed to have been cut from identical cloth, differences existed. Early on, it was reported that some officials in the space agency were skeptical about Mr. Cooper's fitness for the Mercury program. It was said that he was something of a complainer who had less than an ideal regard for the image the agency was trying to project. In later years, after he had left the astronaut program, Mr. Cooper was outspoken in his views about the existence of extraterrestrial life and of unidentified flying objects. I believe that these extraterrestrial vehicles and their crews are visiting this planet from other planets, which obviously are a little more technically advanced than we are here on Earth, he said in 1985. 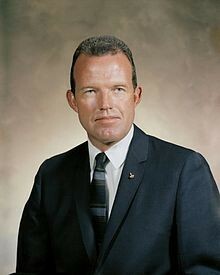 Leroy Gordon Cooper Jr. was born May 6, 1927, in Shawnee, Okla., the only child of an Army Air Corps officer and his wife. Fascinated from childhood by the exploits of the fictional space explorer Buck Rogers, Mr. Cooper took an early interest in flying, and at 7 years old he took the controls from time to time of a biplane flown by his father. He enlisted in the Marines too late to see combat in World War II. He attended the University of Hawaii for three years after the war and obtained an ROTC commission that brought him to active duty in the Air Force in 1949. During four years in Germany, he flew F-84 and F-86 fighters. He ultimately obtained a college degree. He went through test pilot school and later, when NASA advertised for astronaut trainees, he volunteered; he said it was pure curiosity. He left the astronaut program in 1970 to enter private business. Mr. Cooper was said to have believed that frictions within the space program kept him from the moon flights. I would have liked to have gone to the moon, he told CNN in 2000. But it just didn't work out that way.... I certainly don't harbor any bitterness or anger. He married Trudy Olson in 1947, and they had two daughters before they divorced. He married Susan Taylor in 1972 and had two more daughters.